Actually, we should have titled this post, “The Last Two Crashes”, but maybe that doesn’t sound as dramatic. One of our latest finds is a good one. We finally came across a Bowser Frakes airplane, and a crashed one at that (yes!). However, this is no ordinary plane. It just so happens that this photo is from Capt. Frakes last ever intentional crash, but the story behind that last crash is a fitting tale of daring, suspense and disaster. The year was 1940 and Capt. F. F. “Bowser” Frakes was the main attraction for the Oklahoma State Fair and scheduled to perform the last two crashes of his career #98 and #99. On Wednesday September 25, Bowser was set to do his trademark stunt of flying a plane into a small house that had been built just for the act. As he had done so many times, Bowser took the plane into the air and then put it into a dive towards the building, but this time something went terribly wrong. Someone set off the explosives in the house a second too soon and when the plane crashed through the structure, he was engulfed in flames. Bowser was pulled from the wreckage, but not before getting severe burns on his hands, arms and injuring his forehead. Never one to shy away from danger or a great opportunity for promotion, Bowser decided to fufill his duty an do the stunt again on the following Friday. 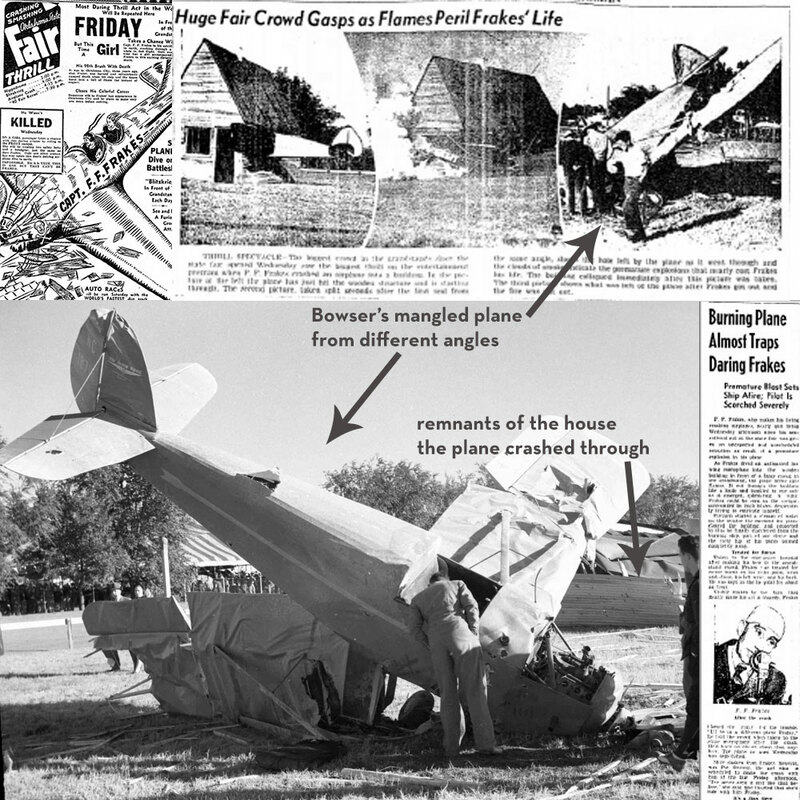 A story ran in the Daily Oklahoman on Thursday September 26, which detailed the crash gone wrong. This also gave the event promoters a chance to run an ad with the headlines, “Most Daring Act in the World Will Be Repeated Here Friday” and “He Wasn’t Killed Wednesday”. No doubt this brought a record crowd to see a real death defying stunt. And, as if that were not enough, Bowser would have a female passenger on board his plane as he performed the 99th and final crash of his career. Friday came and so did the people. Once again, Bowser crashed his plane into the house. Bowser was unharmed this time, but his crew could not find the woman that was supposed to be in the wreck. It turns out that she lost her nerve and did not get into the plane with Capt. Frakes. Can you blame her?